Robert Johnson was a highly influential Mississippi blues singer and songwriter who supposedly sold his soul to Satan "at the crossroads" in exchange for his remarkable talent on the guitar. Born Robert Spencer on May 8th, 1911 and raised in Mississippi, he started playing blues guitar in the late 1920s. Part of the crossroads story stems from a report that he dropped out of sight for a while in the early 1930s and returned a much-improved guitarist. He recorded at least 29 songs in Texas between 1936-37, then returned to Mississippi to play in clubs and bars. His mysterious death at age 27 added to the legend: on the night of August 13th 1938 something happened to johnson in a bar in Greenwood, Mississippi and he died three days later, choking on his own blood and moaning about fierce, black dogs. Maybe he was stabbed, maybe he was poisoned or maybe the Devil sent his hounds to collect on his debt-- nobody knows for sure. In 1986 he was inducted into the Rock n' Roll Hall of Fame as an early influence, and his songs have been covered by several rock acts, including Eric Clapton, The Rolling Stones, and The Red Hot Chili Peppers, to name a few. The legend recently inspired an episode of the CW television show Supernatural. 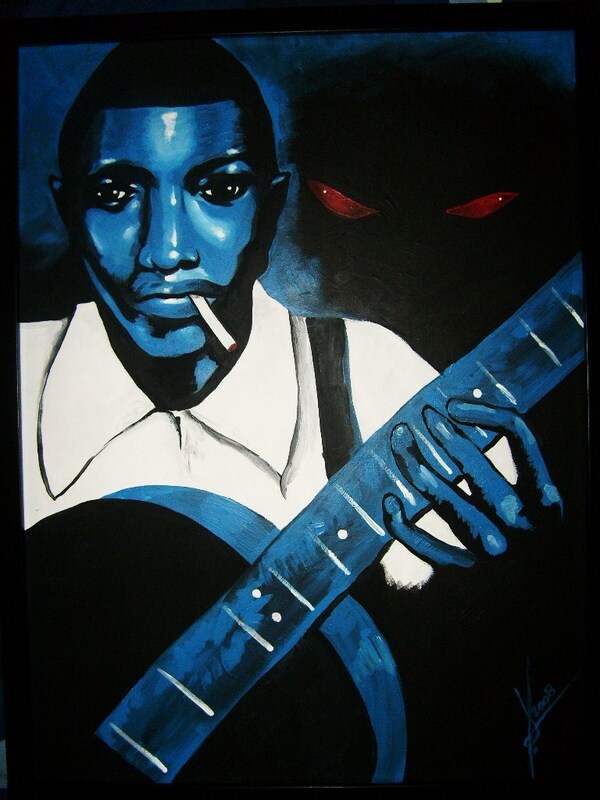 In this depiction, Johnson is portrayed in the chunky, expressive Deep South folk art style with his infamous guitar and a "friend", one of the infernal shadowy beasts that pursued him to his death...and beyond.